You know that annoying message that comes up every time you try to play an online video in fullscreen? 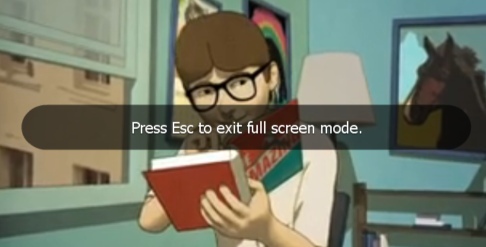 Press Esc to exit full screen mode. Oh, that annoys me, especially when watching a short clip where I've got to either pause it until the message fades or jump backwards to see the bit it obscured. I had long thought this pretty difficult to remove and I sat down with a hex editor trying to find the message in the Flash files. I had trouble locating it and I looked around online to see if anyone else had tried this. They had and they'd gone one better and made an automatic patcher. I tested it on Chrome, IE, Firefox and Opera and it did the trick. 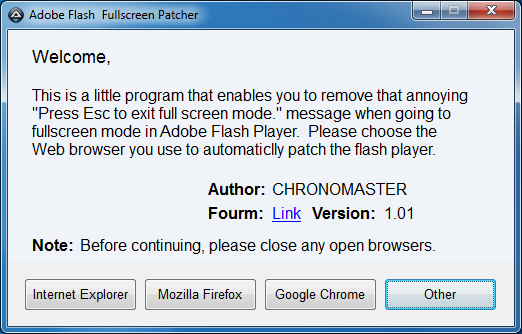 I note that the author wrote it for Flash 10.1, but I just patched all my Flash 11 files with it and it worked just fine. Click this link to go get a copy for yourself. 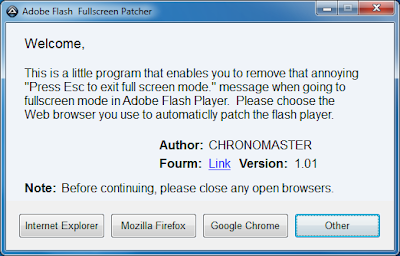 Obviously you'll need to do it again when Flash gets updated.